Falling back from Rehe, Wan Fulin's 32nd Corps retreated to Lengkou Pass, while the 29th Corps of General Song Zheyuan also fell back, Zhang Zuoxiang's 37th Division retreated to Xifengkou Pass, General Guan Linzheng's 25th Division to the Gubeikou Pass. On March 4, the 139th Division of the KMT 32nd Corps managed to hold Lengkou Pass, and on March 7, KMT 67th Corps withstood attacks by the 16th Brigade of the Japanese 8th Division, at Gubeikou Pass. On March 9, Chiang Kai-shek discussed with Zhang Xueliang about resisting Japanese invasion in Baoding in Hebei Province. Chiang Kai-shek began to relocate his forces away from his campaign against the Jiangxi Soviet, which would include the forces of Huang Jie, Xu Tingyao and Guan Linzheng. Chiang Kai-shek also called over Fu Zuoyi's 7th Corps from Suiyuan. However, his actions were too late and the reinforcements were of insufficient strength to stop the Japanese advance. 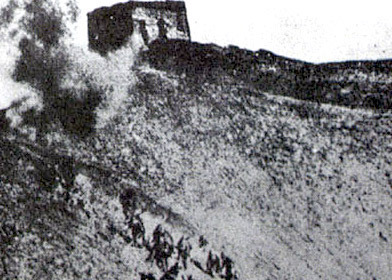 On March 11, Japanese troops pushed up to the Great Wall itself. On March 12, Zhang Xueliang resigned his post to He Yingqin, who as the new leader of the Northeastern Army was assigned the duty of securing defensive positions along the Great Wall. Over twenty close assaults were launched, with sword-armed Northwestern Army soldiers repelling them. However on March 21, the Japanese took Yiyuankou Pass. The KMT 29th Corps evacuated from Xifengkou Pass on April 8. On April 11, Japanese troops retook Lengkou Pass after dozens of seesaw fights over the pass defenses and Chinese forces at Jielingkou abandoned that pass. The Chinese army was significantly underarmed in comparison with the Japanese in heavy weapons and many units were equipped only with trench mortars, a few heavy machine guns, some light machine guns and rifles, but mostly handguns, hand grenades, and traditional Chinese swords. 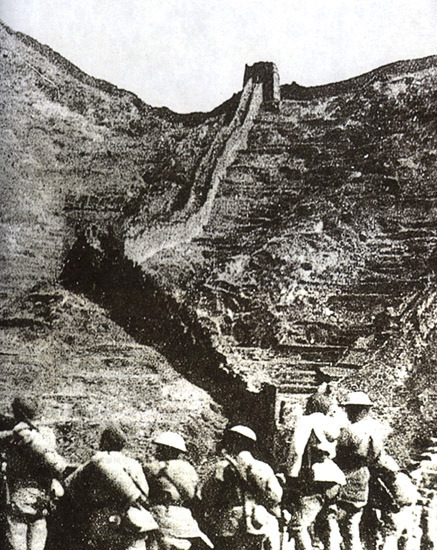 Beaten back by overwhelming Japanese firepower, on May 20, the Chinese army retreated from their remaining positions on the Great Wall. Although the NRA suffered defeat in the end, several individual NRA units like the He Zhuguo platoon managed to hold off the better equipped Japanese army for up to 3 days before being overrun. Some NRA Divisions also managed to win minor victories in passes like Xifengkuo and Gubeikou by using the ramparts to move soldiers from one sector to another in the Great Wall, just like the Ming dynasty soldiers before them. The Japanese struck at a time when most countries were more concerned with the depression than with an invasion in far-off China. The United States introduced a policy of non-recognition, declaring that it would not recognize Japan's conquest. The League of Nations did nothing but condemn Japan formally. Therefore, many consider the invasion of Manchuria as the real start of the war because aggression was not suppressed. Since 1937, Japan had been buying cotton, gasoline, scrap iron, and aircraft equipment from the United States. After the “undeclared war” between Japan and China began in 1937, most Americans sympathized with the Chinese.